Even the most rugged tools require routine service and periodic repairs. 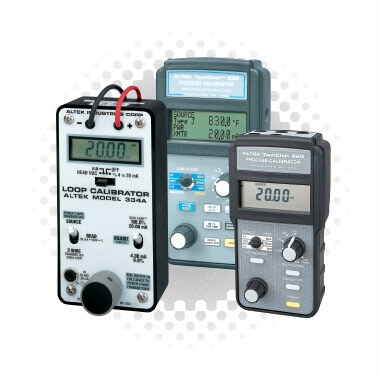 As Altek’s Master Distributor and previous manufacturer of these products, Transcat is the natural choice to dependably service this brand of multifunction, loop, frequency, and RTD calibrators. You can rely on Transcat’s wealth of experience in repairing Altek tools that feature high accuracy and full functionality. We also are a premier provider of accredited Altek instrument calibrations. Both our calibration and repair services offer low costs and fast turnarounds. They benefit a wide range of industries and protect critical assets. Our highly trained repair technicians are dedicated to servicing Altek calibrators with the specialized skills these instruments require and your processes demand. Why Choose Transcat to Repair Your Altek Calibrator? The availability of flat rate pricing on many of the instruments we repair. Plus, you will know this rate before ever sending us the instrument. Free estimates detailing our low-cost services on any unit does not qualify for a flat rate. This quote is provided after we make a quick evaluation of the tool. A post-repair calibration, with certificate, that verifies instrument performance. Our accredited calibrations are offered in various service levels to meet your requirements. The opportunity to bypass the OEM repair. Manufacturer service can often mean more time without essential equipment. Transcat’s fast, responsive service is a great alternative to the OEM center. Extensive calibration and repair capabilities that cover Altek instruments, as well as also those from Fluke, Druck, Meriam, Transmation, and other trusted brands. We also make it easy to track your instrument’s repair online.